Mathilde Beaulieu (Lou de Laâge), a young nurse, is working with a branch of the French Red Cross in Poland in the winter of 1945, after WWII has ended. They are there to find French survivors of the German camps to treat them and bring them home. One day, a Polish nun arrives at the French hospital and begs Mathilde for help. Although the young nurse is reluctant, the nun won't take no for an answer. 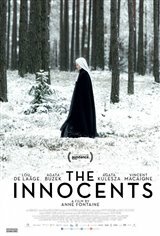 She takes Mathilde to the convent, where six nuns and a novice are pregnant, having been raped repeatedly by Russian soldiers. The nuns have no idea what to do and need Mathilde not only to help with the births, but to help decide what to do with the babies.